High above the bustling streets of St. Paul, Minn., among monoliths of concrete and glass, a daring climber has defied the odds — and the altitude — to capture a city’s heart. 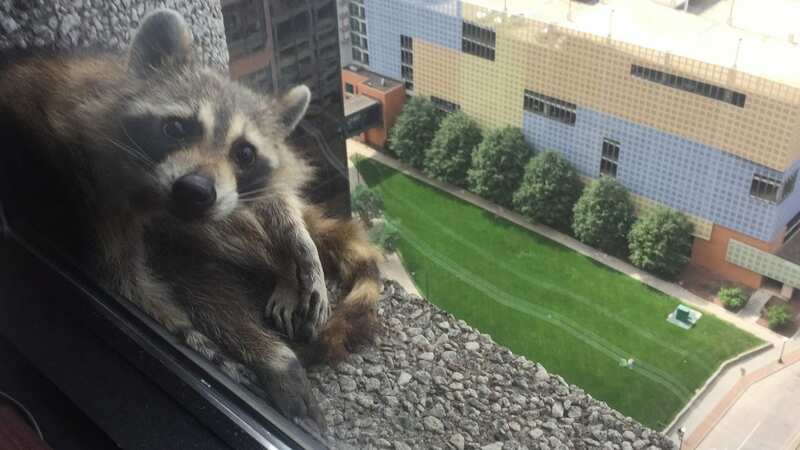 A raccoon has been climbing since at least Monday, when it was spotted resting in a relatively low-level niche outside the Town Square building downtown, according to Minnesota Public Radio. The station says that after a failed rescue attempt, the animal scrambled onto a skyscraper nearby and continued its dangerous ascent. Hours earlier, the MPR newsroom, which has had a front-row seat to the drama, mobilized to cover the epic — better known now as the tale of the #mprraccoon. The hashtag hit Twitter’s trending list by Tuesday evening. Even the raccoon itself weighed in with its regrets, though it remains unclear how the animal tweeted without opposable thumbs — or where, exactly, it’s keeping its phone during the climb. They’ve were treated to a close-up view of some stretching, scratching and a fair share of napping. She says the firefighters told her office that other measures — such as reaching for the animal with window washing equipment — would very likely scare and “endanger the animal.” So for now, the high drama has become a waiting game. Hang on tight, dear Spider-Raccoon. A city’s hopes ride on your shoulders.